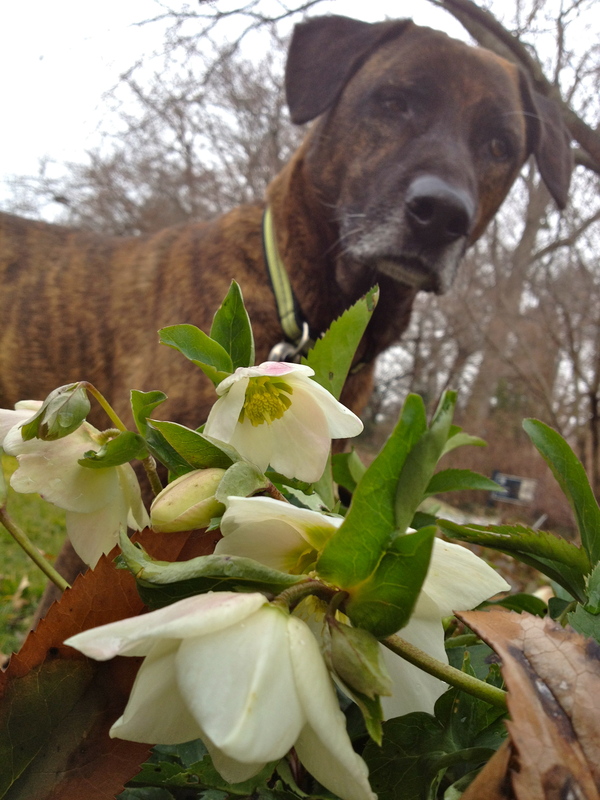 Tra la la, skipping through Swarthmore with my doggie…well, not exactly skipping, more like being pulled by my doggie through Swarthmore…we come across all sorts of botanical treasures. It is usually Larry who finds them first, his nose sending him on a zig zag mission that wraps me up in his leash. Here! They! Are! 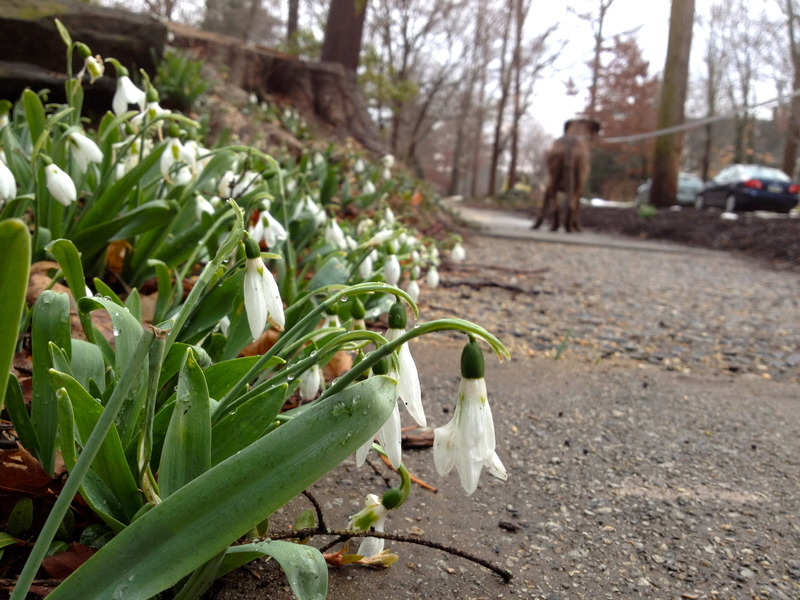 A little deeper digging reveals that these late winter/early spring-blooming beauties have a dark side. Turns out Larry was smelling Cerberus’ spit – which you can imagine is quite toxic – when he discovered the deceptively dainty yellow blooms on Elm Ave. According to Greek legend, when Hercules dragged Cerberus (you know the three-headed canine who guards the gates to the Underworld) to the Upper World, his reaction to the sunny side of things was to froth madly at the mouth. 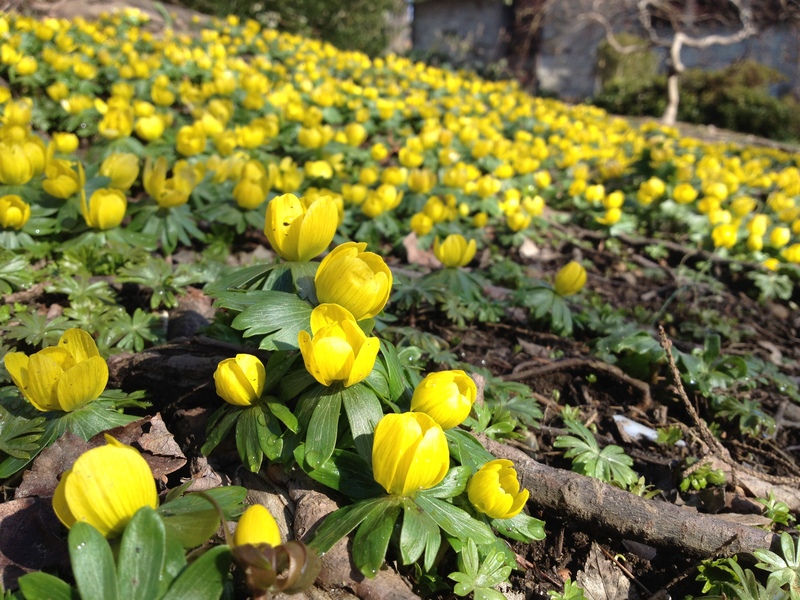 And wherever this crazy beast’s saliva touched the earth, up sprouted winter aconite. Thanks, Cerberus, it’s a nice touch. 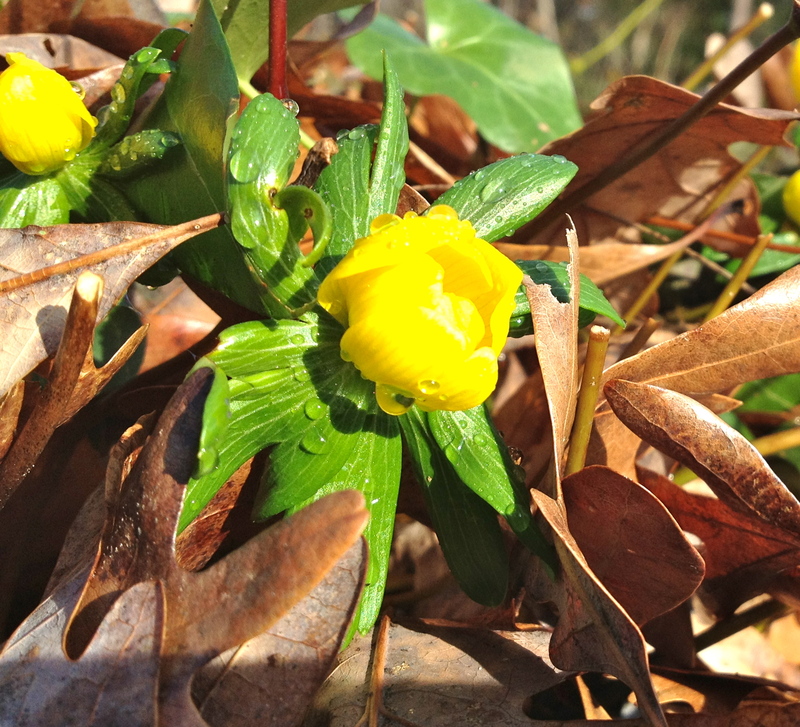 Winter aconite is in fact poisonous – all parts especially the tuber. So, you might not want to plant this if you’ve got dogs (Larry did NOT ingest any of this) or kids who dig in the garden. What else have you found for me today? Okay we’ve been looking at snowdrops, or Galanthus nivalis, for almost a month now. 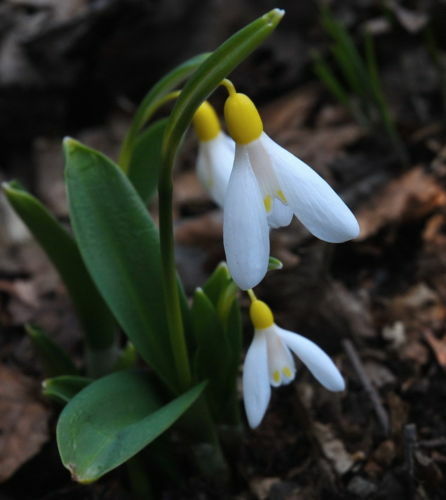 But some fact-finding revealed a great story (or at least I think it’s great) about this early spring bulb. There’s a sort of snowdrop-mania going on in the UK and last year one bulb of the ‘Green Tear’ cultivar fetched £365, making it the world’s most expensive snowdrop (and perhaps bulb?) Well, yesterday, this record was shattered, when Galanthus woronowii ‘Elizabeth Harrison’ was auctioned on Ebay for £725, purchased by the seed company Thompson and Morgan, who say in their press release that “the stunning snowdrop Galanthus woronowii ‘Elizabeth Harrison’ was named after the owner of the garden where it first appeared as a seedling in Scotland a few years ago and it has not been identified growing anywhere else.” It is really striking, with a golden yellow ovary and yellow petal markings. I wonder how long it will take them to produce more, and how much longer it will take to be discovered growing in Swarthmore!